Eva Jeanbart-Lorenzotti, founder of Vivre, a luxury catalog with an undeniably strong editorial point of view has a distinctively chic and global sense of personal style! Honored as a “mail-order magnate” by Time Magazine and one of Vogue’s “ten most stylish women in fashion,” Eva is one of the original and authentic taste-makers of our time. She was also recently a designer mentor on Project Accessories, a spin-off of Project Runway. The former investment banker launched her fashionable publication in 2001, which has since grown exponentially- reaching more than two million customers each year. The overwhelming success of Vivre and launch of Vivre.com has much to do with Eva’s emphasis on classic and timeless style. Eva offers her customers an insider look at a luxe lifestyle to go along with her chic finds. I am excited to share some of Eva’s best-kept secrets and her insider tips, tricks and stylish product picks! MM: What was your inspiration for starting Vivre? EJL: I believed that I could create a catalog that had a very different perspective towards luxury. I had a lot of passion and a lot of ignorance at the time. There are always 99 reasons not to do something- and always one overwhelming reason to do it; the experience is always worth the mistakes you make along the way. Experience is the word for the mistakes we survive. MM: How would you describe your personal style? EJL: Traditional, classic tailored with a twist. I love to wear architectural, well fitting clothing with accessories that tie it all together! When it comes to fashion I am not into the over dressed look. MM: What are some of your favorite recent purchases? EJL: I found this long necklace with beads and different things hanging off of it at (Beads of Paradise) an antique store downtown unexpectedly, and a great pair of blush suede shoes by Prada. MM: What are some of your fashion rules? EJL: Wear what fits you and not just what’s on the pages of a magazine. If something is the “it” thing, it’s only going to be “it” for a second so go for what suits you best. EJL: A look that is over dressed and over accessorized, and mixing things that don’t work together, flip flops in the city. MM: What is your go-to outfit for day? Cocktails? EJL: For day, a great pair of black or grey pants, a well fitted shirt and a leather jacket or blazer with sling backs! For cocktail, an original skirt with an interesting top or a beautiful pair of slacks. I am not a cocktail dress girl-I actually wear more dresses during the day. MM: What do you wear on the weekends? 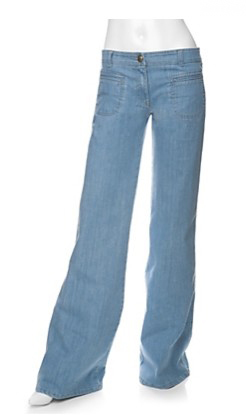 EJL:Lots of jeans-I love J Brand, and fun chords or twill pants. I also wear a lot of blazers and cool jackets with a variety of shirts to dress up the look. I’m seriously coveting these CHLOE jeans! I need them now! !